Every summer I spent as a youth in Mallorca my Grandfather would have a bike for me. I would ride for hours while there however back in England I wasn’t allowed a bike. 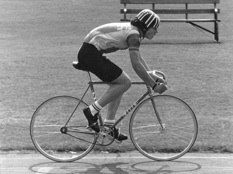 When I was fifteen I was allowed to take a bike back to England and I started to train properly and I started to race. I belonged to first the the Velo Club de Londres and then to the De Laune CC. I just looked up the club and it is now known as London's greatest and oldest cycling club . It also seems that I won a few Trophies in England. I remember winning races in Mallorca but not these. 1981. The Russell Cup, donated back to the Club in 1965 by B Dacey, Esq, is to be held for one year by the winner of the Club 1,000 Meters Sprint Championship. 1981. The Le-Grys Cup, presented back to the Club by Maureen Jackson. This is a perpetual trophy and will be awarded to the winner of the 5-mile Track Championship. 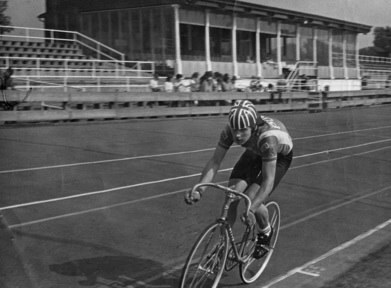 I loved racing on the track and loved the old track in Algaida, Mallorca, and the old wooden track in Harlow, England. I beat Shaun Wallace the year before the Olympics and was hoping to get into the Nationals and perhaps get a place on the GB team, but a training accident two weeks before the Nationals put an end to that. By that time my I was at the Brighton School of Architecture, design being my first love I pretty much hung up the bike. 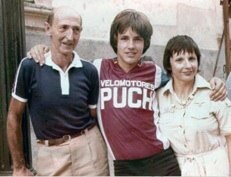 In Mallorca I raced for Casa Capo who sold Derbi and Puch Motorbikes.